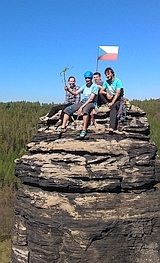 Slovaks Dodo Kopold and Vlado Plulik summited Gasherbrumu I. World Cup in bouldering in Fiera di Primiero (ITA): Czech girl Silva Rajfova finished on 5th place in the finals. Anna Stöhr (AUT) and David Lama (AUT) won.